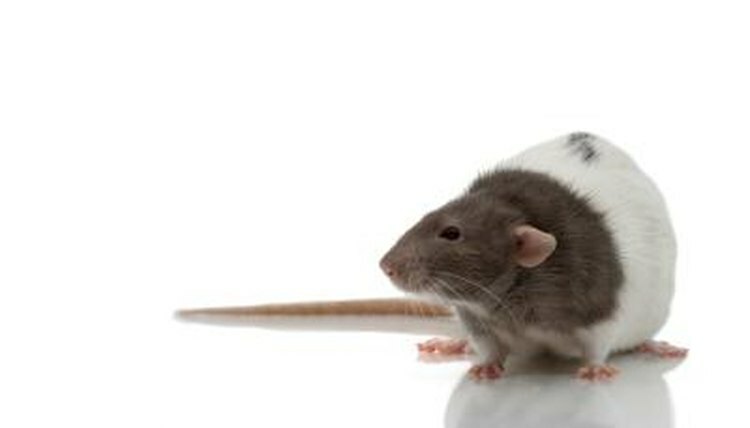 Rats readily bond with people. These highly sociable rodents just need time to get used to you and to trust you won't hurt them. To bond with your rats, spend time in their presence, let them get to know you, and then gradually increase physical contact. Trust provides a foundation for bonding with pets just as it does with other humans. Rats, being intelligent creatures, quickly identify their care provider. Seeing you as a source for food, water, toys, housing, a clean environment and other things they need and want fosters trust. Plus, the essentials keep your rats healthy and happy, promoting normal, sociable behavior that leads to bonding. House your rats in pairs or more, because they need company, and make sure their cage is well-ventilated and roomy enough -- at least 2 feet all around for two rats, but preferably larger. Feed your rats lab block pellets, and bits of safe fresh fruits and vegetables, and give them fresh water daily. Keep their home clean, removing soiled bedding and droppings every day, and replacing all the bedding and washing down the cage and items once per week. Provide appropriate chewing items for their ever-growing teeth, toys for stimulation and a solid exercise wheel for physical activity. To bond with your rats, you must make them comfortable with your handling. This requires hand-taming. Your hands initially appear threatening, so you must get your rats accustomed to them. Override this instinct by teaching your rats to associate your hands with something desirable: good food. Hand-training begins with placing pieces of cereal or store-bought rat treats in the palm of your hand. Slowly extend your hand into the center of the cage. Just hold it there, without making sudden movements, and speak in a subdued but upbeat tone to your rats. At first they may all stay away, or one or two might investigate after a minute or so. Do this every day until your rats all become comfortable taking food out of your hand. When they are all OK with it, switch to offering treats directly from your fingers, allowing for more personal contact. Once your rats trust you and your hands, you're ready to handle them to complete hand-taming. Start by encouraging them to poke their heads out of their cage around you by opening the door and holding a treat just outside it. When one comes to you, let her have the treat and carefully scoop her into your palm. Lay your other hand over her without exerting any pressure. Talk reassuringly to her and gently stroke her back. Return her to the cage after a minute or two, and repeat the process to handle each rat individually. Over the course of a few days, build up the time you spend holding each rat to several minutes. Bonding means more than hand-taming, of course, and the bond between you and your rats will continue to strengthen indefinitely over time when fostered. Sit by the cage every day and talk to your rats. Reach in and pet them and play with them. The best time for play and bonding is during their daily out-of-cage time, when you move them to a secure playpen. You should be doing this for at least one hour every day after you've hand-tamed them. Keep your rats company, interact with them and pet them. Pick each one up for some one-on-one time with you. Place them on your lap or shoulder, and you'll find they often enjoy some nuzzling; they also come to like petting more and more with continued exposure. Don't forget to hand-feed the occasional treat. Just like the cliche about the way to a man's heart, providing delicious food is a sure way to win and maintain a rat's affection.